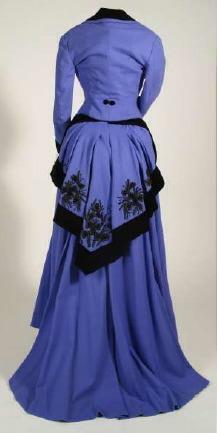 #3802 - c. 1987 Victorian Style Trained Bustle Gown designed by NOLAN MILLER for ELIZABETH TAYLOR's in "Poker Alice". 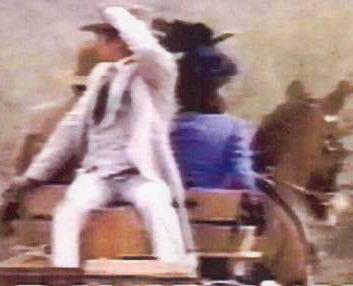 Elizabeth Taylor's stunt double wore this Nolan Miller designed, beautifully detailed, 2 piece period costume in the 1987 TV romantic western "Poker Alice". The outfit consists of a skirt and jacket. The fitted, taffeta lined jacket is periwinkle blue wool with a black velvet collar, lapels and cuffs and a V-neck and front that comes to a point at the bottom. 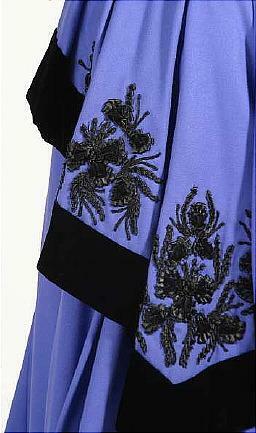 The jacket has an intricate black ribbon and velvet design. The initials E.T. are stitched on the waistband of the skirt. 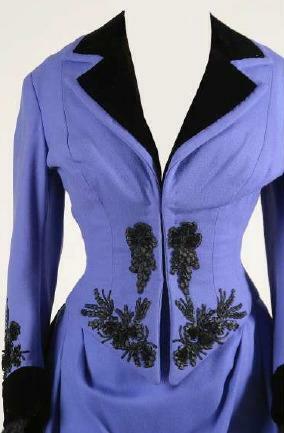 The fitted skirt is the same periwinkle blue wool as the jacket, lined in purple satin with a v-shaped piece in the front and back and black velvet on the edges with black ribbon detailing. 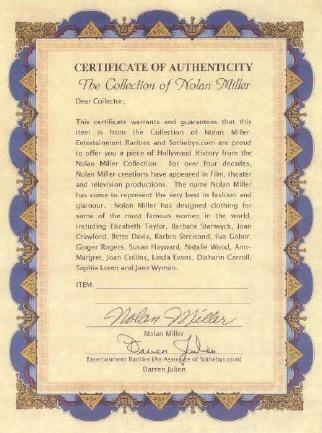 Included is a photocopy of the costume in use, and a certificate of authenticity (COA) signed by Nolan Miller and Darren Julien. 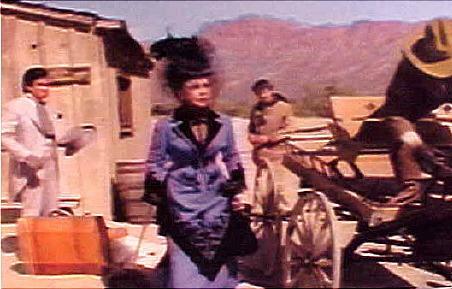 FYI, Poker Alice was a real woman who was a contemporary of Wild Bill Hickok and Calamity Jane! Measures: 15" seam to seam shoulder span, 22" waist (which could be made slightly larger), 39" long from waist to hem in front with a train in back,. 20" sleeve length. The auction estimate of $2000, would have cost you $2300+ with the buyers premium, so the price listed here is less than what Sotheby's would expect for this outfit. An investment piece of Liz Taylor memorabilia., as well as a gorgeous Victorian Style Trained Bustle Gown in Excellent condition!